Electronic Arts has unveiled the first details for the new Star Wars Battlefront II content that ties into the upcoming movie Star Wars: The Last Jedi. This comes just a week after Battlefront II gamers were enraged by EA and DICE's Beta testing for the game. 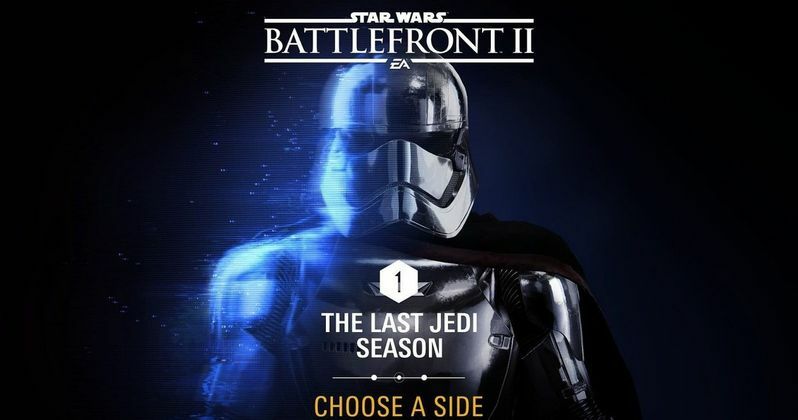 Players discovered they could pay for early access to new content, while fans who weren't willing to fork over extra money, on top of the $60 price for the game itself, had to spend 40 hours playing to unlock characters like Luke Skywalker and Darth Vader. EA has changed their policy, with the company revealing that this Star War content will be free for anyone who owns the game. Here's a statement from the EA website about Star Wars Battlefront II, which launched on November 17, leading into the new content arriving next month. "Battles rage across eras. Lightsaber-wielding Jedi masters duel mighty Sith Lords. Ace pilots face off in thrilling space battles. Inferno Squad navigates the chaos following the fall of the Empire. If you want to start playing today, join Origin Access or EA Access and take an early leap into the Star Wars galaxy with the Star Wars Battlefront II Play First Trial. Enjoy gut-wrenching starfighter battles above five planets, lead spectacular ground assaults on eleven gorgeous worlds, and join Inferno Squad for the first section of the new single player campaign. Using the Play First Trial, play Star Wars Battlefront II for up to ten hours prior to the game's worldwide release November 17. And remember, you can also pick up the Deluxe Edition and start playing to your heart's content November 14. But this is just the beginning. Free content is coming in December with Star Wars Battlefront II The Last Jedi Season, bringing with it new heroes, maps, vehicles, and more." After the initial backlash, Star Wars Battlefront II slashed unlock costs for both Luke Skywalker and Darth Vader, which now take 15,000 credits to unlock, instead of 60,000, which was the equivalent of 40 hours of gameplay. As for The Last Jedi content, EA confirmed that, "every post-launch hero, map, ship, and weapon will be free for everyone who owns the game, so you and your friends can continue playing Star Wars together." The content will be available starting December 5, which starts with each player choosing which side they want to play on. Here's a description of The Last Jedi season of Star Wars Battlefront II below. "It all starts with choosing a side. On December 5, you'll have an opportunity to align with the First Order or choose to fight for the Resistance. Your choice is important, as it will allow you to take part in special challenges that will grant your faction specific rewards. Things kick into high gear on December 13. Your favorite stormtrooper-turned-hero Finn joins the fight for the Resistance and Captain Phasma steps on to the Battlefront for the First Order. They can be purchased with in-game Credits from that week. Whichever faction is victorious in completing the most challenges that week will net a reward as well: a special Crate of high-power upgrades for Finn or Captain Phasma. New locations and vehicles will also arrive. On December 13, the cinematic content from Star Wars: The Last Jedi continues with a new planetary map: Crait. The Starfighter Assault map of D'Qar will join as well, plus a new hero ship, Tallie Lintra's RZ-2 A-wing. Poe Dameron's T-70 X-wing is also upgraded with a new ability inspired by Star Wars: The Last Jedi. In Star Wars Battlefront II Resurrection, you'll join Commander Iden Versio during the days of the First Order's rise to power. These new chapters of Star Wars Battlefront II's single-player story mode will be available December 13. Your choice of faction will continue to matter. Throughout December, you'll see your chosen faction's progress reflected in-game, as you fight alongside allies from around the world to swing the tide of battle." To help keep track of all these updates, Electronic Arts has releaed a "calendar" featuring all of the updates that will be available in the four weeks of December. Since all of these updates are free, except for it seems the Finn and Captain Phasma characters, it seems unlikely The Last Jedi content will cause the same kind of uproar from fans we saw last week. Take a look at The Last Jedi update calendar for Star Wars Battlefront II, and a poster for this season as well.